Premium quality 200Amp air-cooled WP-26V gas-valve head TIG complete torch package for Miller TIG welders with 25-foot rubber power cable. 1-Piece style: power/gas through one cable. With free gift (welding gloves or welding goggle or welding glasses). Free gift may vary upon availability. Premium quality 200Amp air-cooled WP-26V gas-valve head complete TIG welding torch package for all mainstream TIG welders with 25-foot rubber power cable. 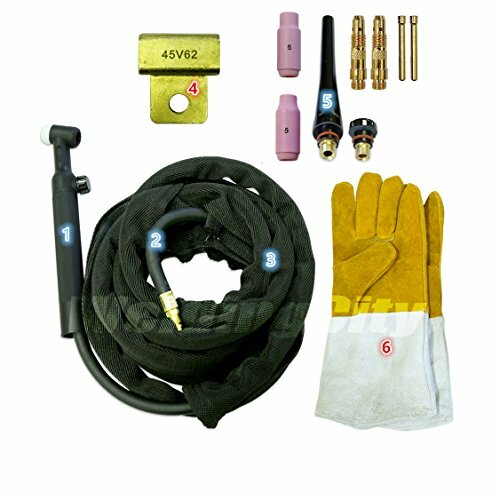 Package includes: WP-26V gas-valve head body with handle; rubber power cable hose 46V30R 25-foot; Nylon cable cover with zipper 24-foot; power cable adapter 45V62; accessory kit and free gift. Ideal replacement TIG welding torch for many brands welders like Lincoln Miller ESAB Eastwood AHP Everlast Weldcraft etc. Appropriate connection adapter needed. See all listed pictures for torch parts and rear plug adapter. CHECK YOUR TIG WELDER FOR MATCHING.